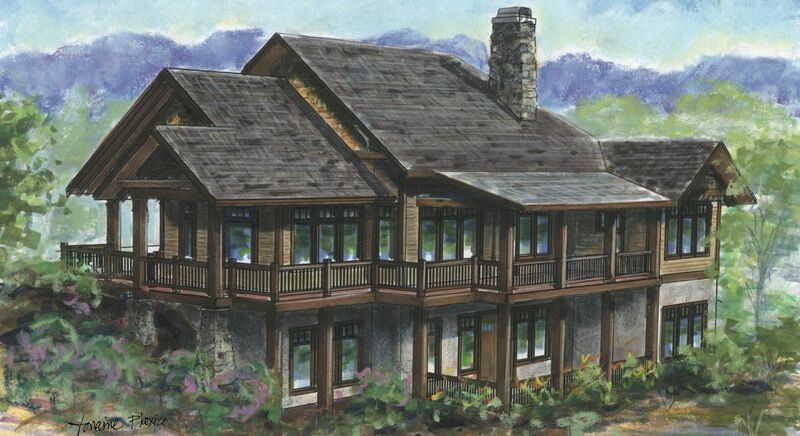 The Cedarcliff is a universally designed home that maximizes your mountain views, boasts a more rustic craftsman feel, and is incredibly energy efficient. This floor plan works well, on a sloping lot, for families of all sizes and ages. With a large master suite on the main level, home office, and large entertaining spaces, it is ideal for the couple that is looking to slow down their professional life and begin enjoying mountain living. Since it has overflow bedrooms, bathrooms, and recreational space on the lower level, family and friends can stay as (little or) long as you like! This 3 bedroom, 3.5 bath can easily be converted into 4 bedrooms and 4 full baths by enclosing the home office. Perhaps the best feature of this home is its orientation to the mountain views and its gracious outdoor living. This “right sized” plan allows for 1748 hsf on the main level and an additional 1116 of hsf on the lower level. The foundation can be placed over a crawl space, unfinished basement, or finished lower level (as shown) depending on your needs and desired budget.